Customize your next promotion with this stress ball. The light bulb shape gives shape to thoughts of new ideas. A custom stress ball that is useful for a fun giveaway item, new service-product rollouts or promotion. The promotional star stress ball features are sealed polyurethane foam construction. Overall size of the ball is 2 1/2" w x 4" h x 2 1/4" d. Bulk packaged in a carton. 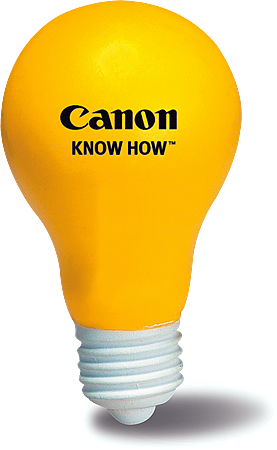 The Light Bulb Stress Ball Color is Bright Yellow and White. Rush custom stress ball production is available. The price includes a one standard color imprint on the ball in an area 1 1/4" diameter. Optional second side imprinted stress ball is available in an area 1 1/4" diameter. The factory set up charge is $50.00 per location, one color only. Running charge for a second location imprint is $.35 each unit. Factory reset up charge for repeat orders is $25.00. Stress balls have a max of a one color imprint.